The coffee offering available in UK workplaces is still failing to hit the mark, according to recent research from Nestlé Professional®, which revealed that almost 60% of employees are settling for second best while at work. Only 42% of staff said that their preferred coffee choice is available to them in the office, while half of those surveyed aren’t happy with the selection of hot drinks available. As a result, around half of those workers surveyed are buying their coffee or tea outside the workplace every week. The research also found that only 37% of businesses provide their employees with access to a contemporary hot drinks machine. According to Webb, this is an important insight: “The tabletop machines market has come a long way in recent years, with a number of sophisticated hot beverage machines now available that are capable of producing a range of coffees that consumers would expect from the high street. The research was commissioned by Nestlé Professional® to mark the launch of the NESCAFÉ® Alegria A510 machine. The tabletop coffee system has been developed to suit a wide range of small workplaces, from hair salons and estate agents to car dealers and doctors’ surgeries. Already widely available through Booker, Makro, Viking and Staples, the machine produces five café style coffees – Cappuccino, Latte Macchiato, Americano, Lungo and Espresso – all from the same coffee cartridge, making the average cost per cup significantly less than other small machines1. The self-serve machine produces five café style coffees – Cappuccino, Latte Macchiato, Americano, Lungo and Espresso – all from the same coffee cartridge, making the average cost per cup significantly less than other small machines. Each coffee cartridge goes a long way and can deliver up to 120 Espressos; or 60 Latte Macchiatos or Lungos, or 40 Americanos or Cappuccinos. The entire coffee cartridge is dispensed into the machine in one go, so there’s no need to refill after every drink. For Cappuccino and Latte Macchiato the product’s unique jet system automatically warms and froths fresh milk directly in the cup for maximum convenience and minimum cleaning. The machine is already widely available through Booker, Makro, Viking and Staples. 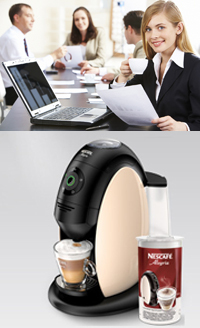 For more information visit www.nescafe-alegria.com. 1. NESCAFE® ALEGRIA A510 retails at a standard RRP of £119. Additionally, the coffee cartridge RRP is £10.99. The resale price and offer is at the sole discretion of the reseller. Pricing suggested is for recommendation only.